Easy to adminster to small pets! Drops must be used together to achieve results. Great for dogs and cats. These are gentle homeopathic formulas to help your pet cope with chronic allergies. Some clients report that these drops are finally the answer to helping their pets with environmental allergies. Allertotal--Homeopathic remedy for environmental allergies such as pollen, hay fever, housedust and helps to cope with food sensitivities as well. 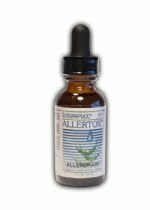 Allerdrain--helps the body drains which can result in allergy-related rashes and skin disorders. Helps provide genearl cleansing and desensititization support. These Allergy Combination Drops should be used along with a hypoallergenic diet, Amazing Omegas and Probiotic.